The chemical name for sugar, a common sweetener made from juices of processed sugar beets and sugar cane or the sap of sugar maple trees. 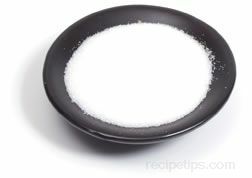 As a carbohydrate containing carbon, hydrogen and oxygen, Sucrose exists naturally within all fruits and vegetables but is most abundant in sugar cane and sugar beets. As water, carbon dioxide and energy from the sun are all absorbed by plants, a process known as photosynthesis occurs to create fructose and glucose. It is the combination of these simple sugars, fructose and glucose, that occurs to create the chemical Sucrose so it can be harvested to produce sugar.